In tracing the roots of this family his own family Laskin captures the epic sweep of the twentieth century. A modern-day scribe, Laskin honors the traditions, the lives, and the choices of his ancestors: revolutionaries and entrepreneurs, scholars and farmers, tycoons and truck drivers. "The Family"is a deeply personal, dramatic, and emotional account of people caught in a cataclysmic time in world history. The torrent of history took the scribe's family down three very different roads. One branch immigrated to America and founded the fabulously successful Maidenform Bra Company; another went to Palestine as pioneers and participated in the contentious birth of the state of Israel; the third branch remained in Europe and suffered the onslaught of the Nazi occupation. David Laskin is the author of "The Children s Blizzard," which won the Washington State Book Award and Midwest Booksellers Choice Award for nonfiction. The author of several other works of nonfiction, Laskin writes for "The New York Times" and "The Washington Post." He and his wife, the parents of three grown daughters, live in Seattle." 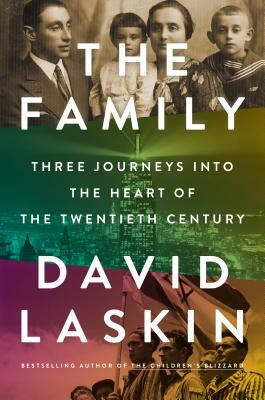 "David Laskin's The Family is an elegantly evocative meditation on the Jewish diaspora of the twentieth century. Deeply emotional at times, The Family is both harrowing and uplifting. Highly recommended! "—Douglas Brinkley, author of Cronkite.